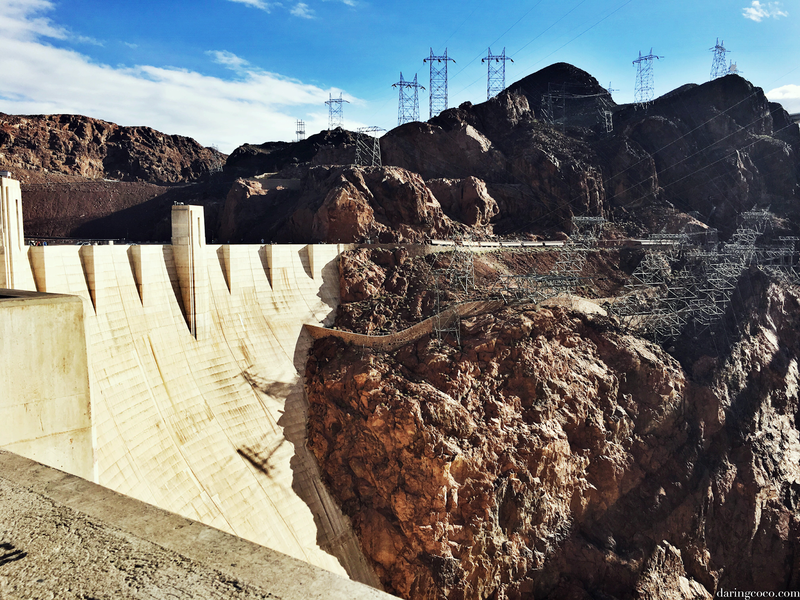 The Hoover Dam originally wasn’t on the itinerary. In fact whilst composing said itinerary this wasn’t even contemplated. More so because our time in this part of the world was brief and because it never really crossed my mind as a point of interest; not for this sojourn at least. 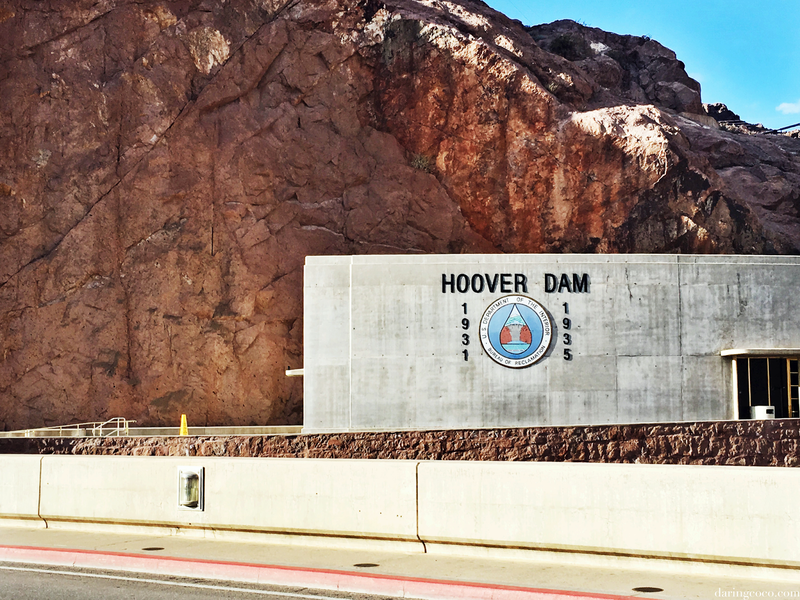 Strangely enough this is a site I feel as though I am overly familiar with, having grown up viewing and hearing copious references to Hoover Dam many times over. And thanks to the countless 1980’s comedic movies I was consumed by as a child, I suppose you could say that the magic of the Hoover Dam was lost on me. Or perhaps there never really was any to begin hence such blatant disregard for one of man’s greatest accomplishments in engineering. But alas as fate would have it, Hoover Dam was indeed explored on this trip; albeit a most brief expedition. Because of a turn of kismet, suddenly this destination was highlighted. Yet in hindsight, it had been a forceful omnipresent the entire time. I’d just been so oblivious to it. 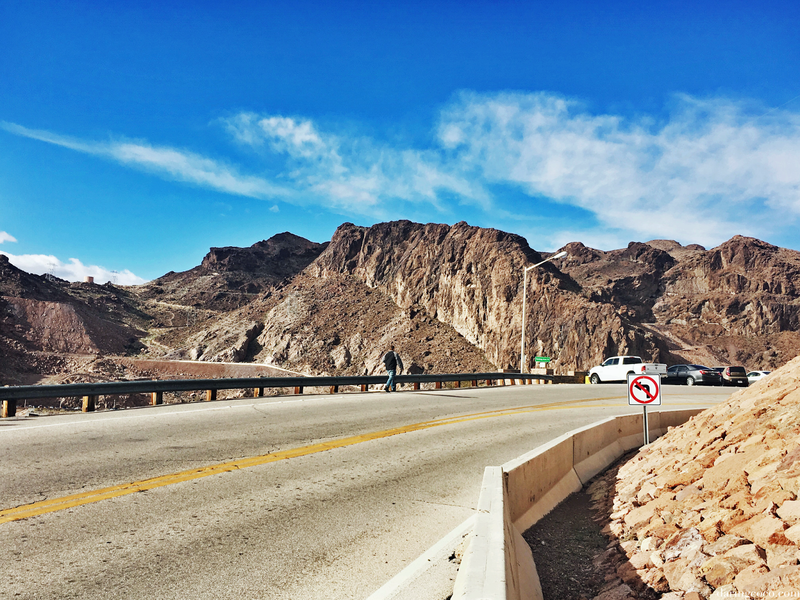 While I noted remarks on it here and there, it was even more present whilst we gallivanted around the Vegas strip, where mentions of the Hoover Dam ran rampant. From tourism signage and placards to mere conversations between individuals waiting in lengthy lines. It was a hot topic of exchange, both in terms of general tourism and environmental matters. 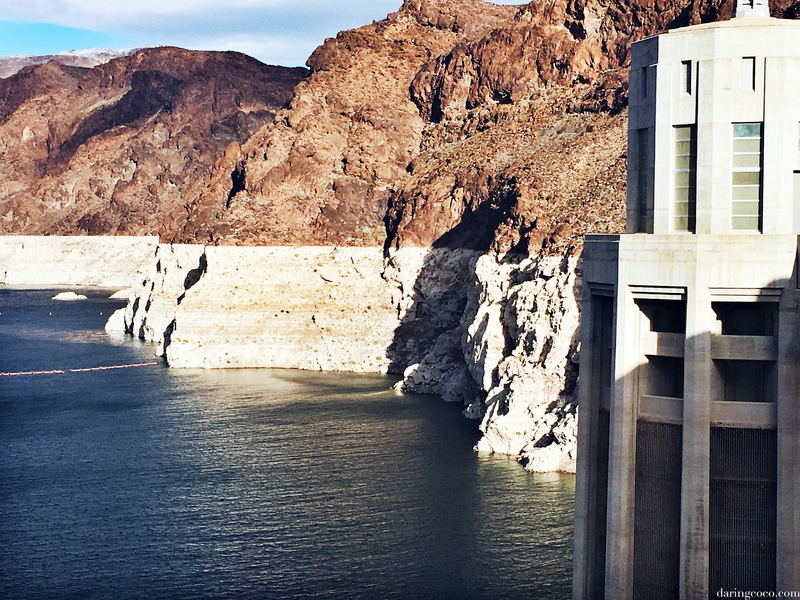 So how did the Hoover Dam actually come to be for us? On our final night in Las Vegas, I checked the National Park Service for any alerts for visiting the Grand Canyon the following day. To my dismay it advised against travel due to the anticipation of a snow storm centred for that area. And thus the catalyst for visiting the Hoover Dam. But it undeniably worked in our favor. Not only did we get to see this marvel in person, we also avoided what would have been a horrendously unpleasant (read, frightful drive for two Aussie’s who’ve never seen let alone driven in snow before) ride through a snow storm. Though we far from escaped such terror as the drive from Hoover Dam to Flagstaff, Arizona saw our last leg literally navigating at a snails pace (and I mean literally). I may be a little dramatic when I speak of this drive as it wasn’t too strenuous. At least nothing our faithful rental Jeep couldn’t handle. We started with a parched landscape which then merged from barren and rocky to even more desolation and eventually thinning out to fall flush with the horizon, passionately emphasizing those monumental beasts we’d just slipped through. After a while a blanket of white curtains and shields the accustomed plain of aridity before us. But in a flash it vanishes as we breeze past, making us question if our eyes were deceiving us. The next few moments do nothing to dispel such emotions as haphazard lumps of white splay here and there; reserved to one side of the road, then drastically moving to the other. At the sight of an upcoming field of snow I pull over and we revel in this phenomena. Our antics score us a chorus of vehicular toots from many a passerby; no doubt recognising the unfolding scenes as none other than Aussie tourist tomfoolery. And while it was all fun and games at dusk, as we moved closer to our destination, nightfall crept and with it, temperatures plummeted as we slowly approached the fringes of a waning snow storm. The very one we tried so desperately to evade. Gripping the wheel I drove forth, unsure and utterly aghast over the possibility of black ice; whatever that was. And because of such uncertainty I kept the car at a leisurely pace, stuck fast behind a large semi-trailer, if he swerved, so did I. I refused to give up my position behind him, undeterred by the numerous vehicles sweeping past us. It felt like a fool proof plan and in the end it got us to out destination in one piece. Despite being hours belated. But enough of those snow escapades, I’ll continue with this story in another post. 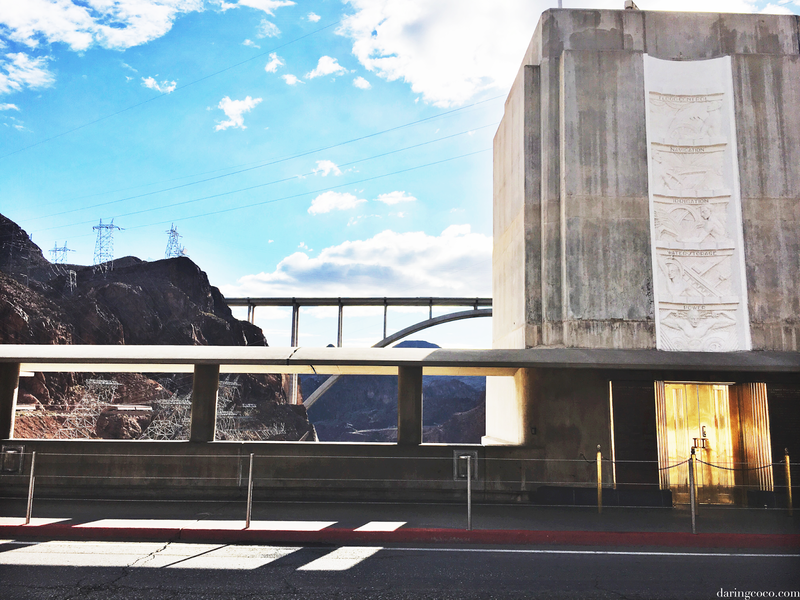 Visiting Hoover Dam was truly astounding and stirred so many emotions within. 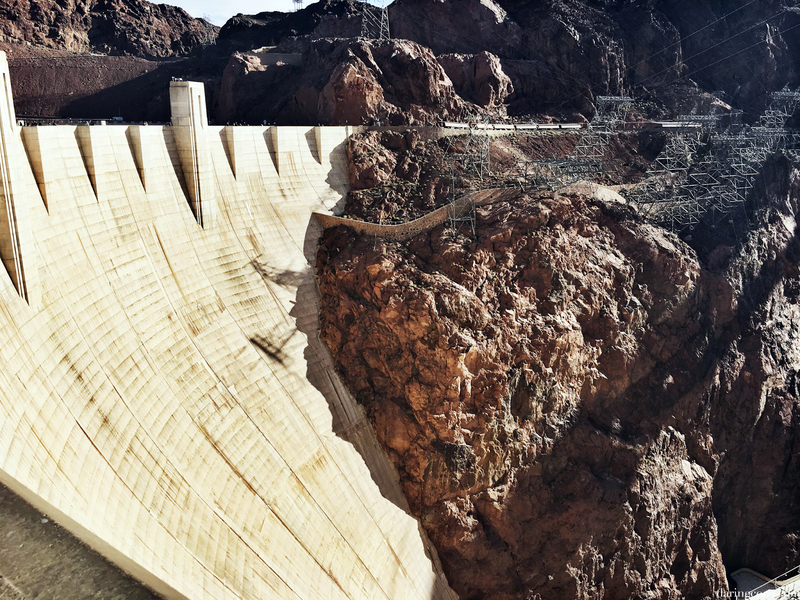 From serious concerns over water levels to the phenomenal marvel of such a prodigious site and the seemingly glorious triumph of manmade engineering. A legitimately monumental feat of construction; one dominating obvious intense power over Mother Nature herself. One so fierce that the actual creation and act of repressing such a mass and body of water literally marred the Earth’s crust and induced hundreds of earthquakes. 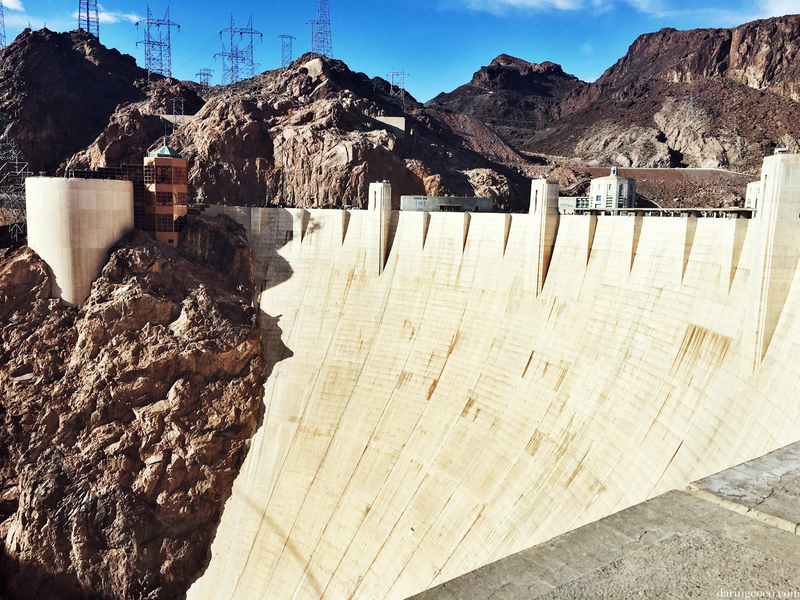 The sheer scale of Hoover Dam is indescribable and it’s easy to see why it had such an impact geologically. And yet it’s difficult to get a palpable sense of this as you drive over it; even while meandering through the various parking lots, catching glimpses here and there. Even when you step out of your car it’s hard to grasp. But as you close in on the reservoir and the Mike O’Callaghan-Pat Tillman Memorial Bridge on foot, the utter majesty becomes evident to the senses. As does the complexity of such an operation. 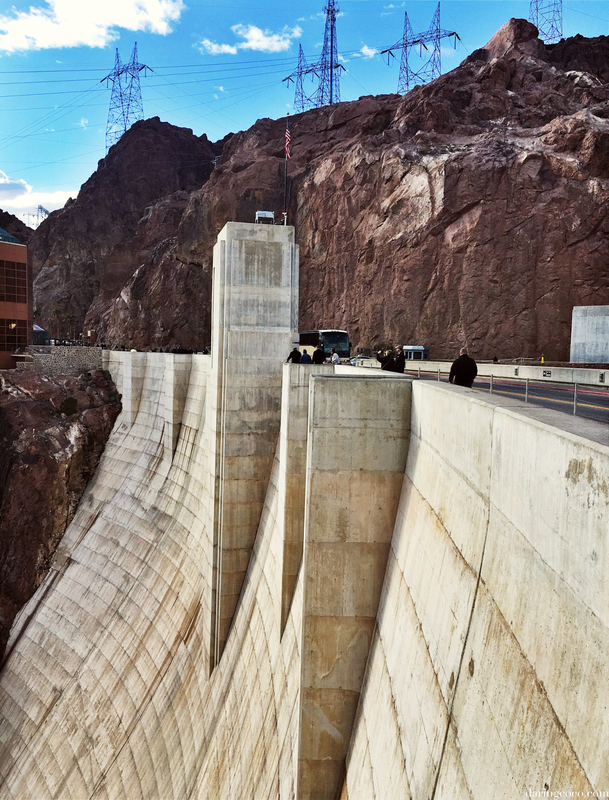 Hoover Dam is dignified, grandiose and imposing. It is largely unparalleled in scale, something that is wonderfully evident as you peer over its walls. 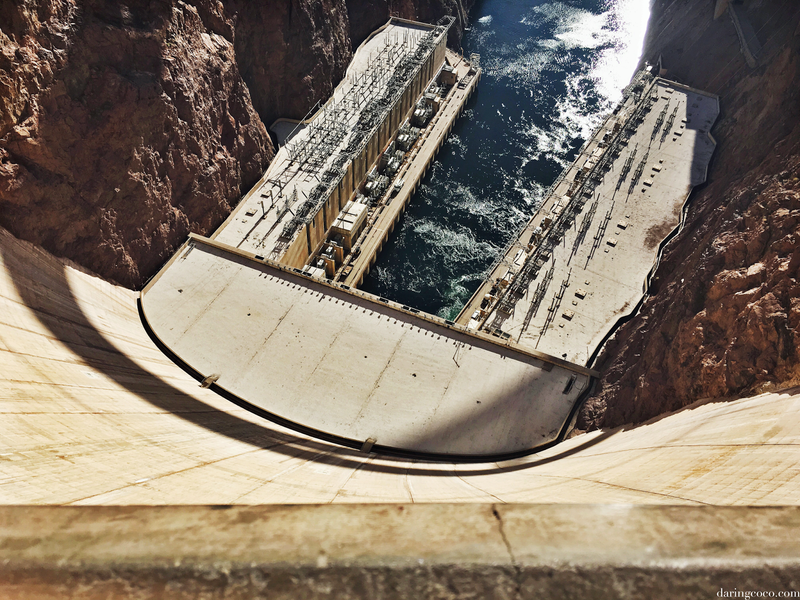 To one side you have the Colorado River pooling at the concrete barrier and around it’s intake towers. 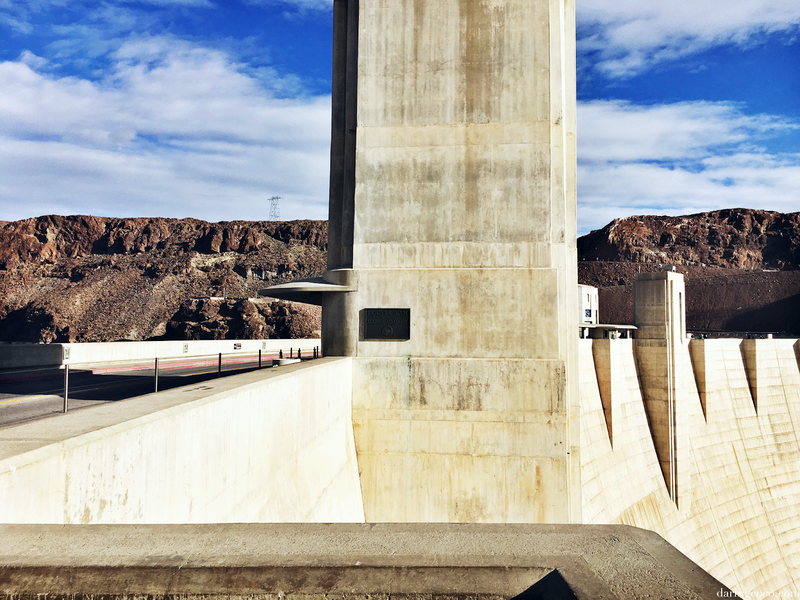 The other side, the base of Hoover Dam where you’ll find the powerplant and a steady stream of water disappearing over the bend. Both sides are very much contrasting yet they share one similarity; those rocky beasts I grew so fond of. Magnificently enveloping, like a protective parent; possessive and vigilant. I could have spent hours just staring down and around those surroundings, analyzing the contrast between nature and manmade. And I must admit, when I first peered over on the side which houses the powerplant, I couldn’t help but unsuccessfully search for that same door Clark Griswold popped out of after getting lost from his tour group. I don’t have the best of eyesight so I was unsuccessful, leaving me to doubt myself. And doubt I did until I found this clip (watch here) in which someone else effortlessly locates it. I won’t lie, I’ve been examining my photos for signs of it but alas can not make anything out. If you can spot it in any of these photos, please let me know below in the comment section. There are also many notable references to the Art Deco period, which I found to be nicely unexpected. From monuments to sculptural reliefs, you’ll find many dotted throughout. There’s been much debate over time about these embellishments and their appropriateness. Some say it’s too lavish and jarring for such landscape and structure. Others believe it compliments it beautifully, paying homage to a time of great dexterity and grandeur. I happen to agree with the latter. I didn’t get a chance to suitably view those memorials nor the flamboyant statues and sculptures. To be honest, I had no idea I’d find such things. Outrageously I didn’t even detect these pronounced references myself. I was far too lost with mans achievement and the intricacies of nature. It wasn’t until we were about to depart and as I walked past a grand golden door (see the image above) I overheard a man pointing out to his partner the Art Deco reliefs above it. He started to explain the importance and meaning behind each one, I was instantly fascinated, immediately observing the various references throughout the site. They’d been there all along and I was totally oblivious to them. I did attempt to eavesdrop further but there was far too much bustle in proximity. 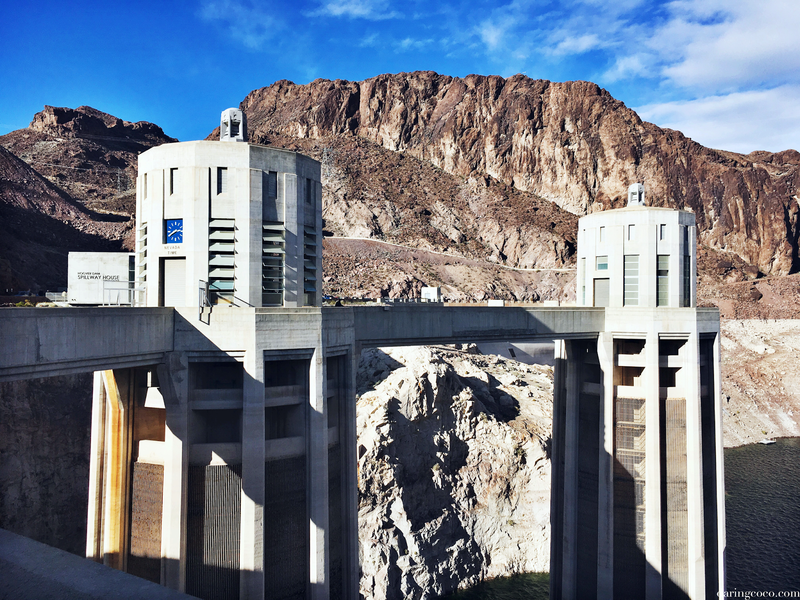 Art Deco references shouldn’t be of surprise considering Hoover Dam was constructed in 1931 and completed in 1936. Many lives were lost during it’s development with tales of bodies being carelessly buried within the structure. 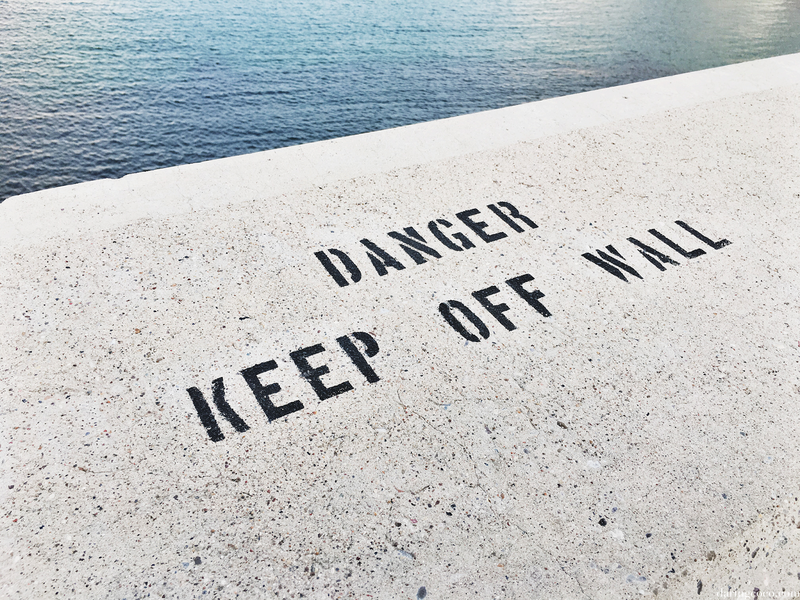 Though I doubt there would be much validity to those stories since decaying corpses would cause air-pockets and obvious signs of concrete weakness would be evident. Their loss of life is no joke and has been somewhat immortalised within the vicinity through copious monuments, all varying in scale and design. 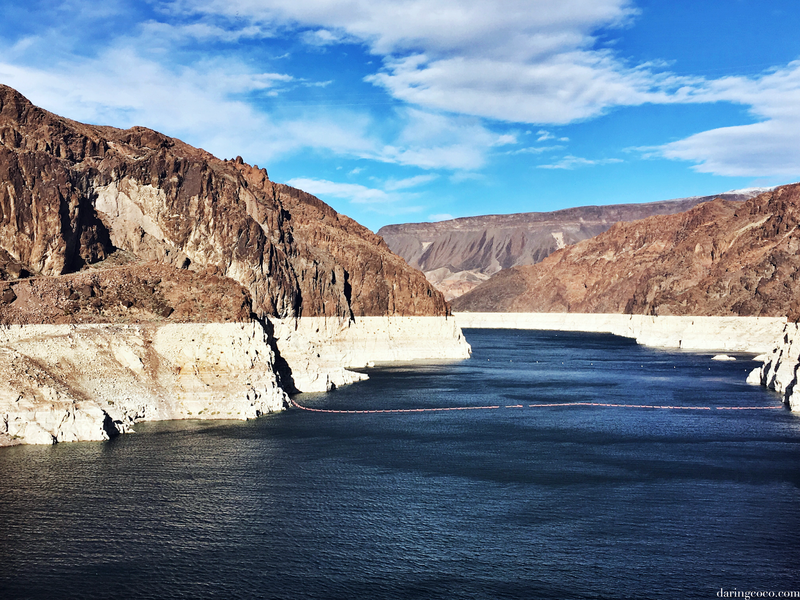 While magnificence is seemingly evident there is something rather unharmonious about Hoover Dam and that would be the notable drop in water levels. One sharply annotated on the sides of those cliffs. 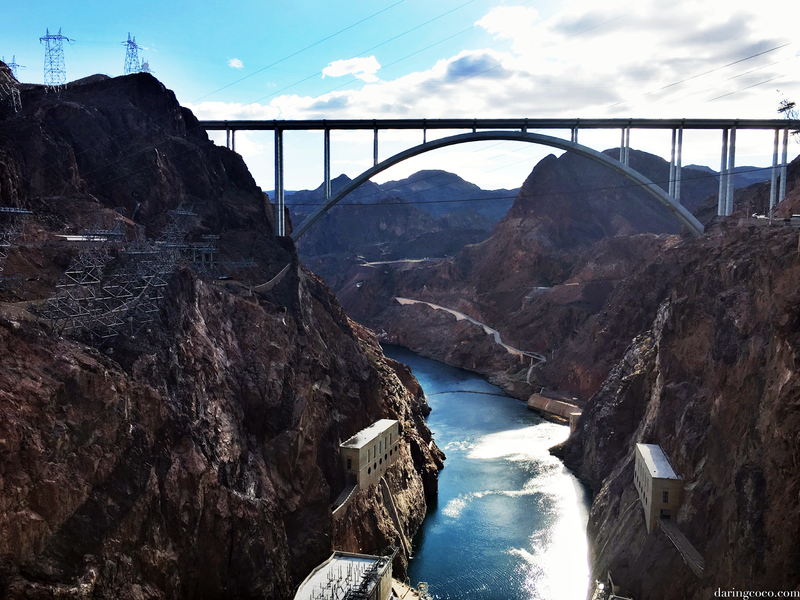 Water levels was something I overhead many a time when others spoke of Hoover Dam. In fact conversations were mostly fixed on this very subject. They wouldn’t point out the brilliance of man or the dramatic scope of the site, it was always the decline and plunge of that reservoir. There were notable hints of despair and concern laced in their voices; a sadness even. And yet what baffled me most was with this genuine unease people were ostensibly doing nothing to aide the issue at hand. As an Australian, drought is something I’ve grown up with. And this isn’t something solely reserved for rural or arid areas either. Drought encompasses our main cities too. Melbourne went through extreme and concerning dearth a few years back spanning over decades no less. Back in 2008 our reservoirs dipped down to an alarming 30%. During that time we banded together as a whole to limit our use and preserve what very little we had. And we did so well before this too, back in 1996 restrictions were put in place which were carried out for many years. Showers were limited to four minutes only and households were sent miniature hourglass figurines to assist in this. Watering one’s garden beds could only be done so during dawn and dusk but this didn’t include lawns. And washing your car wasn’t permitted as the use of a garden hose was banned. Though you could take your car to a car wash and have it cleaned there. These were extreme measures but it needed to be done. 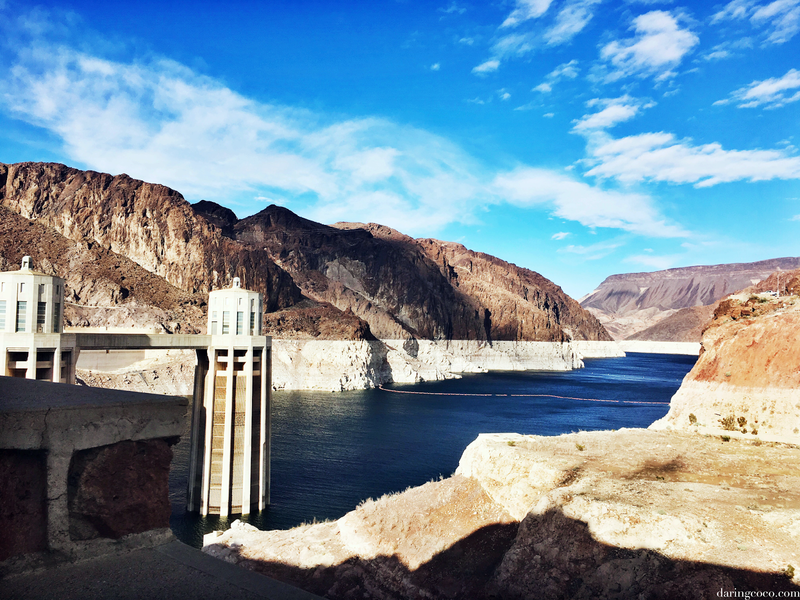 So as someone who lived the majority of her life with water restrictions and the constant threat of aridity to come to Hoover Dam and witness something similar was disheartening. Especially to see that residents and companies were still so careless about this precious and essential natural commodity. Passing through various towns and states one thing was a constant. Homes and front yards were immaculately green and vehicles were constantly spotless and fresh. Then there are the numerous fountains you find in Las Vegas, unceasingly on display. Peoples concerns were rife and yet it felt like they were burying their heads in the sand, thinking this too shall pass. And maybe it will, but is it truly going to hurt to consume less? To have patchy brown lawn or fountains that use recycled water? Regardless I’d highly recommend a visit to Hoover Dam. Especially if you find yourself in Sin City. It’s a short drive from town and is a place that needs to be seen to be believed. Or at least to cross off your bucketlist. It is one the seven wonders of the world and that should be motivation enough. This post has been a work in progress and is one that has taken much time and effort to creating. I’ve found myself lost in thought, daydreaming and reminiscing on my time here. Mostly regrets though as I wished I had planned our time better or done some research so I could have made the most of this visit. I’ll definitely go back again, this time I’d take those tours to see its inner operations as well as perusing the many memorials throughout the site. 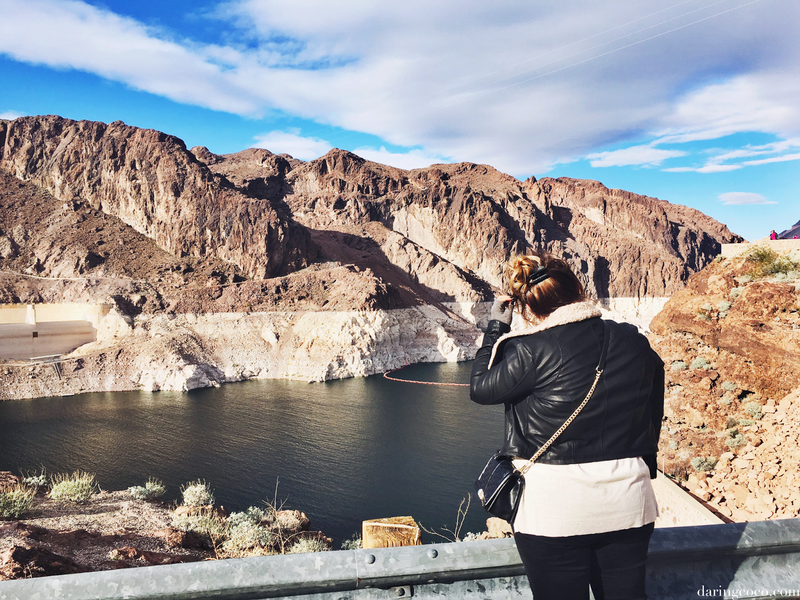 Hoover Dam is immense in size not just in scale but in sights to actually see. I’d would love to venture back immediately though I feel it would be best to wait for the winter months as I can’t even begin to imagine how busy it becomes during the summer (or how anyone even manages parking for that matter). It was rather crowded when we visited which wasn’t peak season so just imagine what it would be like later on in the year. Honestly I don’t think I could manage in terms of parking and crowds.